Thank you to the hundred people from our network who completed the EQ Advocacy survey. The purpose of the survey is to help us understand the needs of our network, and how we can support you to more effectively advocate for EQ. We have another survey specific to education / social-emotional learning. This survey was focused on the business sector. Here is a summary. Q: First, if we could grant one wish to help you be more effective in spreading EQ — what would you ask us for? More evidence in a clear, compelling way to share in business – bottom line, ROI, cases. 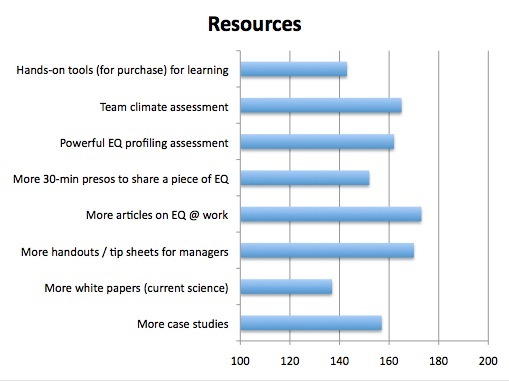 Clear “elevator pitch” for EQ. 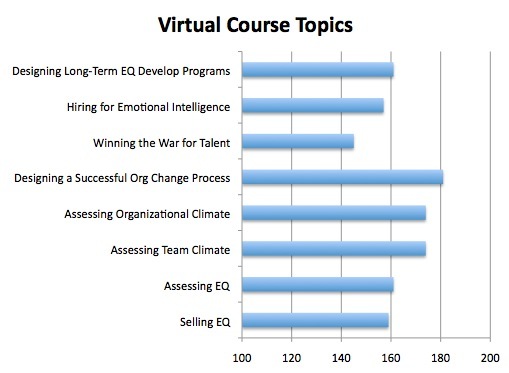 Development for us to understand EQ better ourselves. Templates / ideas of how to articulate the message. Simple, quick pieces to share with managers. Tips. 30-min workshop. 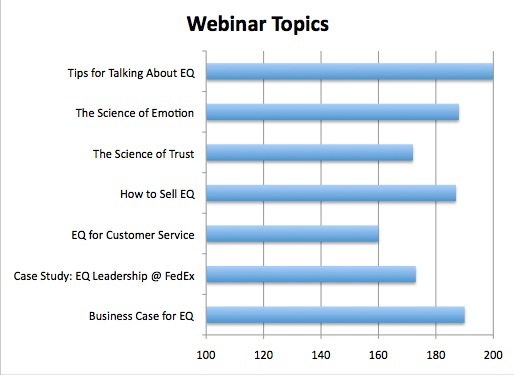 Q: What Webinar topics would be most valuable to you? Q: What Virtual Courses would you like us to offer? A: We’ll introduce a virtual course on our change process in late Q1 ’03. The other top 2 are about climate assessment, and we’ve got a great program for this with the Vital Signs Model (here). Q: What resources would you like? A: We will continue to work on articles re [email protected], and we’ll begin to release more “tips & tools” handouts. Liking the free webinars, especially when recorded. All these ideas are fabulous and, I believe, very useful, and probably, necessary for today’s business world.